Words from the Wild: Favorite Columns from A Yankee Notebook, by Willem Lange, 2015. 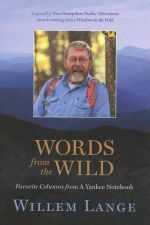 This collection of 28 essays from the beloved host of the award-winnning "Windows to the Wild" series on NH Public TV covers a variety of adventures in the New England outdoors, from traversing the Presidential Range to running the Rapid River to mushing with sled dogs in northern Maine. The essays are drawn from the long -running column, A Yankee Notebook, and are full of Willem's trademark wit, curiosity and natural storytelling ability. Illustrated with color photos 156 pp.,6" X 9."